Released: June 29, 2011. Directed by: Michael Bay. 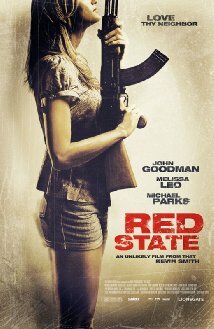 Starring: Shia LaBeouf, Rosie Huntington-Whitely, Tyrese Gibson. Runtime: 154 min. A fault for me for the Transformers films is the fact that they can work as stand-alone films because Optimus Prime gives a little narration at the beginning of each film, which also introduces a new artifact where the Autobots will have to find this thing before the Decepticons do. Essentially, these films are exactly the same. But some of them are kind-of fun. This one improves on the first sequel by giving a stronger narrative, but its length is still exhausting. The Autobots, this time around, have to find the pillars that was on a spacecraft piloted by Centennial Prime that crash-landed on the moon (a creative spin for the reason the members of Apollo 11 went to the moon) in the war of Cybotron. 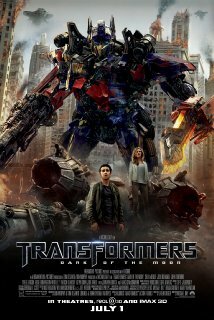 The Autobots have to get there before the Decepticons to save the world. They harbour a powerful enough energy to cause that Chernobyl mishap, which is a kind-of creative reason to describe it, too. I like those blockbuster twists on past events to add alternative causes. Shia LaBeouf is back as Sam Witwicky, who gets a bit of an annoying characterization since he wants to matter again, and he flaunts his Hero’s Medal to anyone he meets. It’s a a funny difference from his reluctance to initially help in the previous film. He really wants recognition and it gets to the point of being whiny. The only one who hasn’t been too impressed by the medal was Megan Fox’s Mikayla, because now Sam has a new hottie named Carly (a meh Rosie Huntington-Whitely, a super model turned actress), who is a personal assistant to a billionaire, Dylan, portrayed by Patrick Dempsey. (He must be some sort-of entrepreneur because he collects a lot of cars.) The chemistry shared between LaBeouf and Huntington-Whitely is nothing special. Ms. H-Whitely doesn’t do much, except just look dirty and somehow manages to survive during action sequences. The ending of the finale is a bit lazy, and if it were any other movie I’d be mad at its laziness, but since it drags on so long it was welcome. Villains who still opt to help the Decepticons when they don’t really have to anymore is uninspired and it just prolongs the flick. In terms of ambition, some action sequences are pretty spectacular, but too long, and they’re reminiscent of several other sequences we’ve seen so far in the franchise. There a few characters who make this something fun. Tom Kenny is still very funny as Wheely, a Decepticon turned Autobot. John Malkovich shows up as Witwicky’s boss in a funny role. John Turturro is also good, but he gets outshone this time around by his sidekick Dutch, who is portrayed by a very funny Alan Tudyk. They are some redeeming aspects of an otherwise stupid film where there’s a Decepticon that reminded me of the huge worm from Men in Black 3, and where a character quotes Spock as a reason for attempting to take over the world. Released: February 11, 2011. Director: Dennis Dugan. Stars: Adam Sandler, Jennifer Aniston, Nicole Kidman. Runtime: 117 min. One can only watch an Adam Sandler flick so many times before it gets worn out. Apparently, one could only watch “Just Go With It” twice before it gets worn out. Adam Sandler and Jennifer Aniston have a good chemistry that grows better as the movie goes along. They never particularly hate each other, but they have to act like it because the hoax is that they’re divorced after many years of happiness. The hoax is grown by Sandler’s Danny Maccabee who carries a ring around with him for years. He was left at the alter by the one he loved (his real life wife, Jennifer Sandler), because of his huge nose. He’s never been able to throw the ring away because if he has it, he won’t be hurt again. He meets an extremely attractive young woman, Palmer (Brooklyn Decker), and after she finds his wedding ring in his pocket, he makes up a story about how he is just getting divorced. Of course, she wants to meet her. The successful plastic surgeon Danny enlists the help of his assistant (Jennifer Aniston) to help him out with the cause, and her kids (Bailee Madison, Griffin Gluck) get sweeped into the debacle after the kid schemes his way into a Hawaii vacation. There, Danny and Katherine (Aniston) must keep the scheme alive without falling in love in the process. 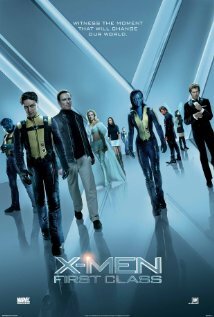 The movie is watchable, but it isn’t great after multiple viewings. First viewing, it’s okay. By the third viewing, it’s not even good background noise. It’s usually fairly funny, but only if you like predictable humour. And even for a movie like this, it’s too tedious at 117 minutes. Half of the occurences in the film just happen because they can. Nick Swardson has an irritating German accent, just because he can. He has goofy glasses. There’s no point to it, since Swardson’s character Eddie, Danny’s best friend, wouldn’t have met Palmer prior to the vacation he schemes his way on. Swardson also isn’t very funny, here. One of the only movies he’s been funny in, in all honesty, is “The Benchwarmers.” I also don’t know why Maccabee and Katherine had to tell people they were getting divorced while shopping and preparing for the charade. Brooklyn Decker certainly isn’t cast for her acting abilities. She’s cast because she fills out a bikini well, but couldn’t we have gotten a young actress with talent and a hot bod? Alice Eve wasn’t available? Decker’s cleavage should have gotten higher billing than Decker herself. Released: July 29, 2011. Director: Raja Gosnell. Stars: Hank Azaria, Neil Patrick Harris, Jonathan Winters. Runtime: 103 min. This is not my type of movie. I watched it because I wanted to see how bad of an animated movie many people say it is. It’s torture, in all honesty. I feel bad for all the parents who get dragged to this. Some of it’s really amusing to kids and I even got a laugh out of it at one point; but that’s it. The story’s terrible, as is the villain, Gargamel (Hank Azaria). 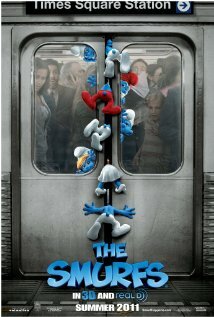 The story is this: When the evil wizard Gargamel chases the tiny blue Smurfs out of their village, they tumble from their magical world into New York City. It’s okay how the writers show that the smurfs are in an odd land, but it isn’t even worth a giggle most of the time. I don’t think I watched the show much as a kid; but I can tell that all the charm and magic of the original show has been squandered in the money grabbing way Hollywood turns that ’80s classic into a visually great CGI-live action mash-up. However, the movie is more annoying than charming. There’s just nothing going on. Neil Patrick Harris and Jayma Mays do their best. It’s also cool to hear so many celebrities voicing the smurfs (Katy Perry is Smurfette, George Lopez is Grouchy, Anton Yelchin is Clumsy, etc.). But it doesn’t feel like they are the characters so many adults loved as kids, because many are just versions of the actor voicing them. At least those celebrities are more for the adults than the kids, because the kiddies won’t know half of those celebrities from Adam. The movie just doesn’t do anything for the animation genre and it is torture for adults. 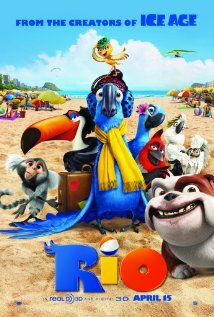 It’s up there with “Alvin and the Chipmunks: Chipwrecked” as one of the worst animated movies ever. Though, animated movies are usually pretty good, so it’s not the worst statement in the world as the movie is still getting a 38. “The Smurfs” is just tedious. The little blue things substitute the term ‘smurfing’ for whatever word they want, so this feature becomes smurfing irritating really smurfing quickly.